Last month’s Mystery Fish was the Redbreast Sunfish (Lepomis auritus). 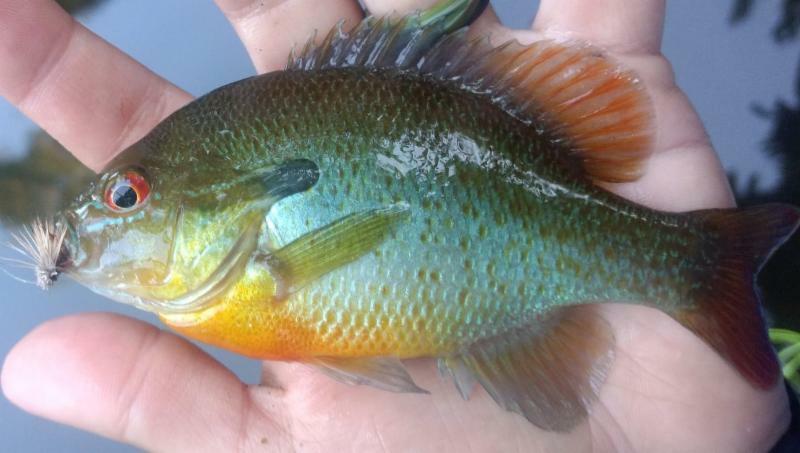 The Redbreast Sunfish is one of Connecticut’s native fish. It prefers good quality water and is more likely to be found in a large river or stream than a lake or pond. A few characteristics include the dark “ear” on the gill cover, an orange breast and dorsal fin, a body without many stripes, bands, spots or other markings. Occasionally with some turquoise worm-like banding on the face. Redbreast Sunfish are fairly aggressive and can be caught using a variety of methods (fly fishing in the photo below). To see the statewide distribution of the Redbreast Sunfish, check out the DEEP fish community viewer and select “Redbreast Sunfish” as the species.